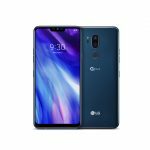 A bit late entry from the house of LG, G7 thinQ is a flagship phone with huge 6.1 inch 1440×3120 pi, 563 PPI LCD screen. With a super bright 1000 nit display, it definitely comes across as a great media and multi-tasking smartphone. A stylish waterproof unibody teamed up with Snapdragon 845 and 4 gigs of RAM under the hood, this phone is surely one of the best buys in its price segment.